Decades from now, when all of social media is a single feed implanted directly in our brains, my grandchildren will climb up on my solar-powered rocking chair and say “Tell me about Twitter.” I won’t tell them about the bad stuff. I won’t tell them that Donald Trump’s hair had its own Twitter account, or that on full moons, trolls emerged from under bridges to prowl hashtags with impunity. I will tell them this: Twitter was a magical place where one minute you’d be joking around with a bunch of writer friends, and the next minute someone would say “HEY, HOW’S ABOUT WE DO AN ANTHOLOGY,” and a few weeks later an actual book with our names on it would be available on all digital platforms. That’s how this queer romance anthology series started back in October: a Twitter joke turned serious-ish business. 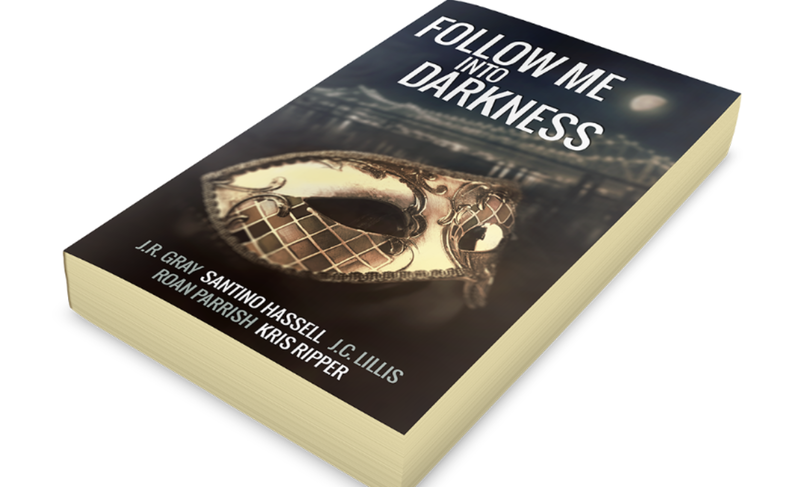 A free Halloween antho jump started a series of holiday-themed collections, our second being the new Mardi Gras-inspired collection called Follow Me Into Darkness. I’m thrilled to be part of this group—I read and write mostly long-form fiction and didn’t think about anthologies much until these came along, but now I see how valuable they are, especially for authors and readers of queer romance. We need all kinds of stories, and anthologies offer more chances for all different types of representation across different genres. Heath is a young doctor from North Dakota, a life a far cry from his childhood on the streets of Brazil. He’s returned to interview for a job, and enjoy Carnival. Javier’s life has changed in so many ways. From the streets to a penthouse, there is barely a hint of his old life left. But one thing remains the same: he is still hiding who he is, and his life is more complicated than when he had nothing. Zavier: Zay is the guy who’s used to being the wallflower at every party. He grew up as a socially awkward and painfully shy teen, took that on as his identity, and has had trouble shedding it. Unfortunately, he’s yet to meet someone who’s drawn him out of his shell. Keegan: Kee is a grifter who lives for the moment. He gets by on his sharp wits and charming smile, and isn’t above lifting an expensive bauble from a wealthy tourist if they’re careless enough to let him get close. However, most of his adventures have been solo because he’s also leery about who he lets in. Why you wrote this story: “Shorts are hard. I admire writers who can spin these beautiful meaningful tales in so little words because I struggle to do the same and often worry about choosing the right words and the right scenarios to inspire feeling in the reader. When pondering the prompt for this anthology, and fighting against the part of myself that insisted I couldn’t do it, I decided I wanted to tell the story of a whirlwind romance. And what romances are more breathless and exciting than those that happen during festivals? Ven and Farley, the seventeen-year-old actors who play Hamlet and Horatio in a TV drama about Hamlet’s teen years. They’re not exactly the best of friends—but a soliloquy-off at a Mardi-Gras-themed cast party could change everything. Philippe Rondeau runs a jazz and blues speakeasy in New Orleans. Sometimes when he touches someone he sees their future. Claude Rivers is a talented young jazz musician recently arrived in New Orleans with a dream of integrating people through music. Why you wrote this story: “I’ve been living in New Orleans for the last few months and this city is magic. So when the chance arose to write something set here and set during Mardi Gras, a time of year that intensifies that feeling of magic, possibility, and the carnivalesque, I couldn’t resist. In terms of the time period, I chose the 1920s because it was a fascinating period in New Orleans—a time when the French Quarter was a hotspot for authors, musicians, and artists from all over the world. They were creating their own little bohemia, but doing it in a spot where locals already had a diverse and vibrant culture that was being overwritten. Also, did I mention all the absinthe? Prohibition…yeah, that didn’t really take in New Orleans. Romantic leads: Whether there’s romance in this story will be up to the reader. Three people share intense encounters over a few days, and one of them is changed forever. Why you wrote this story: “This story has been in my head for years. It’s one of those stories; no matter what else I wrote it lingered, patiently, in the shadows, waiting until I was ready. Once I saw the carnival/waterfront/mask prompt, I knew I couldn’t write anything else. Follow Me Into Darkness is out on February 4th from Open Ink Press. It can be found at Amazon, ARe, B&N, and other retailers.